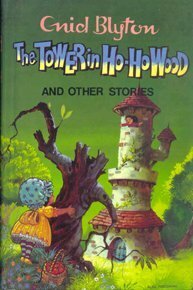 The Tower in Ho-Ho Wood by Enid Blyton is a children book. The book is illustrated beautifully by Lesley Blackman. The book has 14 short stories. It's a perfect read for children. All the stories give some kind of message. I really enjoy reading it. It made me remember my childhood days when I also believe in prince and princess or magic. The author makes you laugh by her stories. My personal favorite is Susan Sweet and Sally Sour. This story hurt my stomach. It is perfect for 6-13 years old. But other ones can also enjoy it. It's a light read. The language is simple. I recommend it to all. Enid Mary Blyton(1897-1968) was an English author of children's books. She was a prolific author who penned estimated 800 books over about 40 years. Her stories were often about children's adventures, mystery, or based on fantasies involving magic. The popular books include The Famous Five, The Secret Seven, The Five Find-Outers, Noddy, The Wishing Chair, Mallory Towers, and St. Clare's.